TSS PRO 500 prevents saltwater erosion, weatherproofs, protects, and preserves rock and masonry patios, pool copings, walls, walk ways, waterfalls, and other landscaping structures will resist many stains and make the removal of stains much easier. TSS500 is an industry tested, quality stone enhancer that protects against salt water erosion and staining. It is a user friendly, solvent based silicon polymer that infiltrates deep into the surface, protecting natural stone, grout, concrete and masonry surfaces. TSS500 comes ready to use, with a fast curing process that will leave you with a transparent barrier that won’t yellow over time. Once applied, TSS500 forms a molecular connection with the surface material, fashioning a clear, powerful, water resistant bond which will act as a lasting barrier against water, pool chemicals, basic acid washing, salts, and other minerals found in water. Why Do I Need to Seal My Stone? The importance of keeping your indoor and outdoor natural stone protected with professional grade sealant cannot be understated. Chances are you?ve invested a great deal of money in your stone accent feature or countertop. Things like toothpaste, scratches, calcium buildup, mold and mildew stains, and household cleaners can destroy your indoor stone floors, countertops, fireplaces, and feature walls. If the stone feature is outdoors on a patio, walkway, or pool coping an even greater number of things can damage and stain your stone. Chlorine and saltwater can cause pool coping and surrounding decking to erode, spall, and become infested with calcified formations. Water can penetrate untreated stone, causing mold growth and mildew stains. Left untreated, mold and mildew can continue growing and splitting your stone beyond repair. A professional grade stone sealant prevents mold growth, protects from chemical and saltwater damage, and stops erosion. 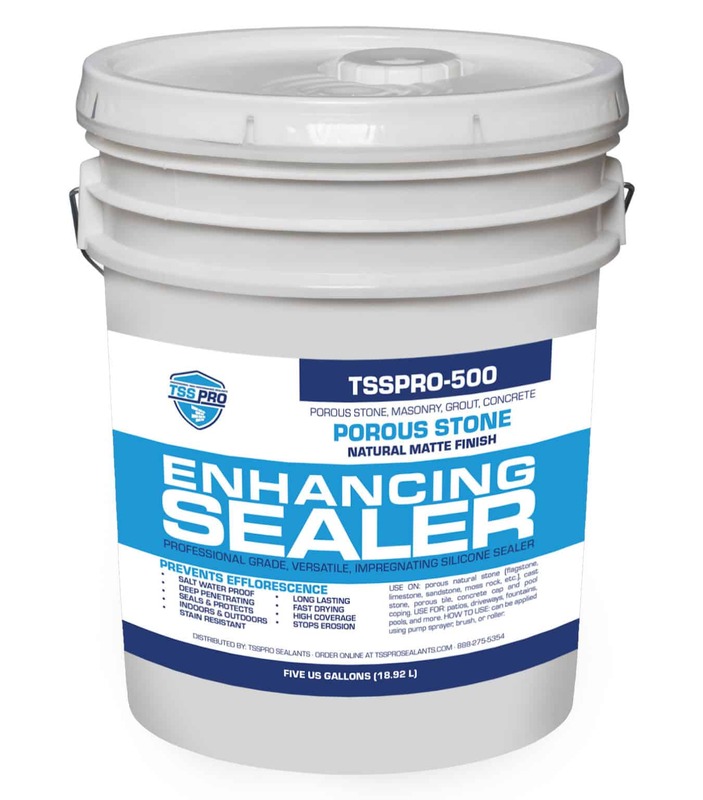 TSSPRO-500 Ultimate Enhancer Sealant offers a clear matte finish with silicone solvent based protection to enhance the natural beauty of the stone?s color and pattern while offering maximum protection. What Type of Stone Can I Use TSSPRO-500 Ultimate Enhancer On? And many other porous services. Do not use on granite, marble, quartz and other dense substrates. If you’re not sure if it’s okay to use it on your stone, just contact us and we’d be happy to offer advice and feedback. What Is TSSPRO-500 Ultimate Enhancer? Simply put, TSS Pro-500 Ultimate Enhancer is the high-performance, solvent-based silicone sealant you?ve been searching for. It’s specifically formulated for color enhancement, offering all of the protection you need while still guaranteeing beautiful results. TSSPRO-500 color enhancing stone sealant is perfect for dense natural stone like flagstone, slate, travertine, pavers, and can even enhance the color of stained concrete floors and man-man stone countertops. It’s saltwater proof, making it perfect for use near a salt water pool, and even in areas around chlorine pools like copings and decking. It can be used multiple times until you achieve the desired effect. Repeated applications will continue to darken the surface you’re working with until everything is just the way you like it. Though the TSS Pro-500 Ultimate Enhancer is designed for use on nearly any surface, you?ll find maximum success using it on materials like stone, pavers and brick. This means that if you?ve got a nice paved walkway leading from the curb to the front door of your home, or you?ve got a nice stone area out back where you like to relax and unwind on a warm summer day, TSS Pro-500 Ultimate Enhancer will dutifully serve you every step of the way (no pun intended). And many other porous services. If you’re not sure if it’s okay to use it on your stone, just contact us and we?d be happy to offer advice and feedback. How Is TSS Pro-500 Ultimate Enhancer Applied? TSS Pro-500 Ultimate Enhancer sealant is easy to apply with either a sprayer, roller, or brush. Whether you’re looking for something that you can complete as a do-it-yourself project or you’re going to be enlisting the help of our passionate and professional team at Texas Stone Sealers for professional stone sealant application, everything is delightfully straightforward. You can apply TSS Pro-500 Ultimate Enhancer using either a brush, a roller or a pump sprayer depending on your personal preferences. Why Should you Choose TSS Pro-500 Ultimate Color Enhancer Stone Sealer? You should use our Ultimate Enhancer sealant to protect your investment. Simply put, the stone, pavers, bricks and other materials that you installed are an investment in your property. If these materials are going to be outdoors, you need to work extra hard to protect that investment from mother nature, chemicals, and saltwater. If you’re looking for the best color enhancer sealant for flagstone, travertine, Oklahoma stone, and other natural or man-made surfaces, TSS Pro-500 Ultimate Enhancer should be at the top of your list. Our proprietary color enhancing sealer blend provides long lasting, affordable protection that you can depend on for years to come.